My birthday is kind of a holy day for me. I try to take it off, spend it in a graveyard if at all possible. I’ve celebrated my birthday in Pere Lachaise, in the Bone Chapel of Kutna Hora, and in Colma’s many graveyards. Like the poet said, “Any day above ground is a good one.” If there’s sunshine and green grass, birdsong and statuary, or trees and flowers and poetry involved, so much the better. In 2012, I spent the morning of my birthday poking around Westwood Village Memorial Park near UCLA. (I featured it as a Cemetery of the Week.) I’d been to the cemetery once before, in the winter as night was falling, when it grew too dark to photograph anything, let alone find anyone other than Marilyn Monroe. I still had a wonderful time, sitting on a bench under a huge, spreading tree, listening to the night settle down in the big city. 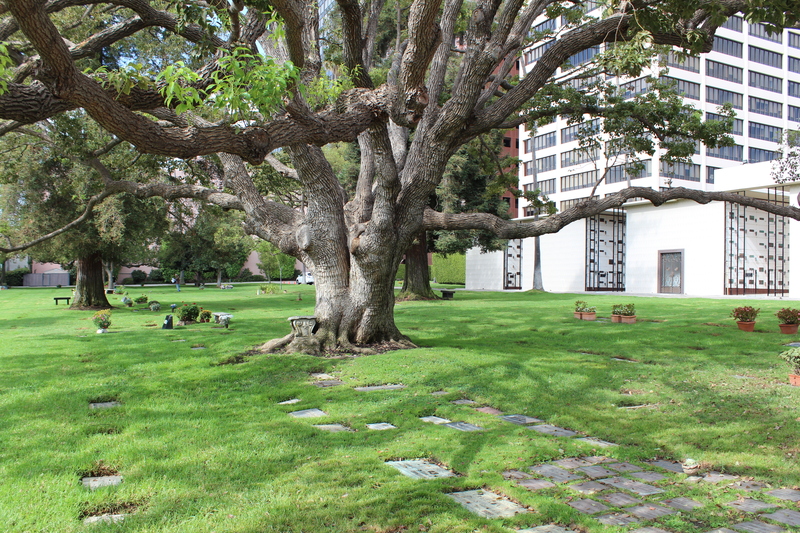 I wanted to visit Westwood in the daytime, to see if I could find that same sense of peace. 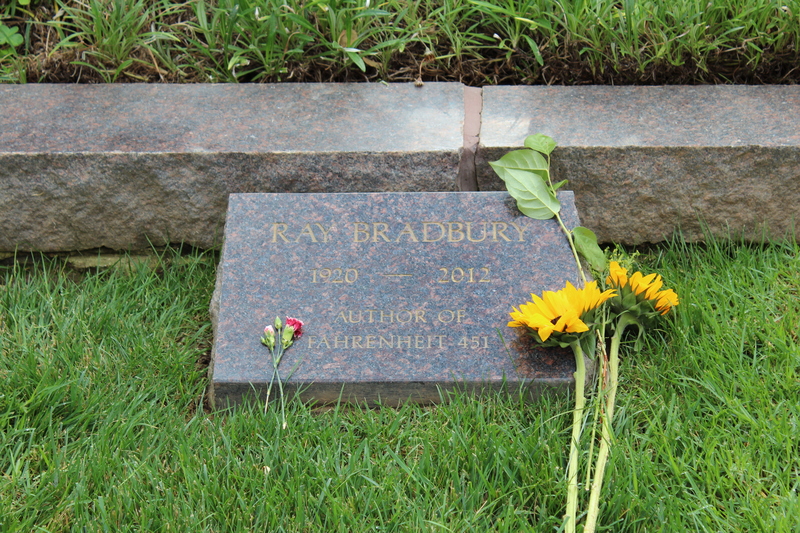 Better than that, I found the grave of Ray Bradbury. Ray Bradbury is my literary hero. I’ve read his books to pieces. I’ve underlined and analyzed and memorized his writing. I had the opportunity to meet him only once. I was so tongue-tied I could barely tell him how much his work meant to me. Luckily, I think I was more eloquent as I stood over his grave, despite the tears in my eyes. It’s like he knew me. In the book, the autumn people are the bad guys, but I am an autumn person. I am headed to the grave, spiraling closer one year at a time, but every day in the open air is a blessing and a gift. It’s been a joy to have Ray Bradbury’s stories as company along the way. I’m glad I finally got to tell him that. This entry was posted in horror writers, Travel adventure and tagged cemetery essay, Cemetery Travel, Los Angeles, my brithday, Ray Bradbury. Bookmark the permalink. I love you. It’s a perfect Bradbury fall back here. So I miss you. It is a lovely cemetery tucked away like that. I got to visit with my son once years ago and was in awe of all the names I recognized. Enjoy your fall! I like Ray Bradbury too. Happy birthday if I have missed seeing the exact day.